One can read hundreds of quotations and advice about the benefits of travel, using the world as your classroom and venturing outside your comfort zone. But what happens when you have the privilege of meeting others from around the world…right in your own backyard? It’s amazing. Interacting with international visitors in your hometown is an incredible privilege that illuminates culture and life in a completely new way. 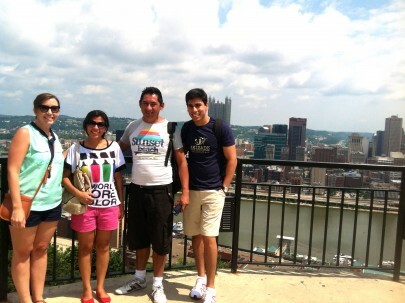 I have had the privilege, as an Amizade intern, to experience the first ten days of Amizade’s first ever English Language and Culture in Pittsburgh program in July of 2013. Offering programs in the United States for international visitors is a key component of Amizade’s Fair Trade Learning model. Other components of this model include our engagement in community-driven development, and facilitating “a free flow of service and learning across borders.” This program is truly this model in full force and action, and it has been incredible to see the impact that just a short time has made on both myself and our visitors from Brazil. Bianor is a 39-year-old nursing student and English grammar teacher, Alins is a 22-year-old medical student, and Lidiane is a 24-year-old Portuguese tutor. 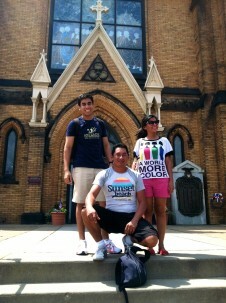 They are some of the funniest, most kind-hearted people I have ever met, and I have known them for less than two weeks. Having visited Jamaica, I have seen firsthand the incredible warmth that those from other countries extend to people they have only just met, and I am so amazed by the way that these two gentleman and beautiful woman have brought that spirit overseas. They are so eager to learn, experience, and make friends. They always seem so happy to see me when I arrive at the office and we have had such a wonderful time exploring the city of Pittsburgh together. They are learning so much about America, and I am learning so much too. I tell them as much as I can about our city, and they respond with questions such as “Where do the names Monongahaela and Allegheny come from?” “How many universities are in Pittsburgh?” “How many miles away is your home?” “How are bridges built?” I’ll admit, they’ve stumped me more than once, but in seeking these answers I have learned along with them, and the excitement I find in this is truly Fair Trade Learning at work. There is so much to this experience that it is difficult to put it all into words. Their English skills are awesome, and I can’t wait to see how they grow from their daily ESL classes. They love to learn, they are patient, and they are not afraid to make mistakes. Bianor absolutely loves to eat and crack jokes. Lidiane extends an unparalleled warmth. Alins is incredibly smart. Last week, they experienced the Three Rivers Regatta, the Fourth of July, and the Amish community. This week, we are working with the Food City Fellows program, exploring the Strip District, learning about local food, and cooking together! They will see more of Pittsburgh in one month than I think I have seen in my entire life growing up here, and I cannot wait to experience more of it with them. More stories to come! Read about Amizade’s Global Service-Learning program in Pittsburgh that welcomed a group of young men from Northern Ireland.